SmartStrand Forever Clean gives your floors some amazing advantages against all the challenges of day-to-day life. 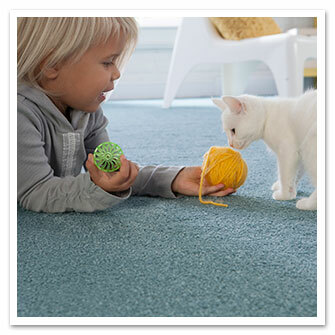 This is the perfect carpet for families with kids and pets. With it's permanent built-in stain and soil protection will never wear or wash off making cleaning up stains a breeze. Choose from plush or a pattern look to brighten up your rooms. Why Shaw's carpets? What makes them better? We call it the Shaw Advantage. The Shaw Advantage exemplifies Shaw's commitment to creating innovative carpets and products; meeting the unique needs of busy families. Private label distributor of America’s finest carpet manufacturers. Plenty of stylish, upscale choices for your outdoor living space. Monday - Friday: 10:00 a.m. to 5:00 p.m. Copyright © 2004-2015 Fehrenbach's Flooring Plus, Inc. All rights reserved.